You the Better is one of Beckman’s early films, which are generally structured like games, developing their narrative out of themes such as accumulation, competition, and the organization of thoughts and memories by means of rules, symbols, and symbolic thinking. 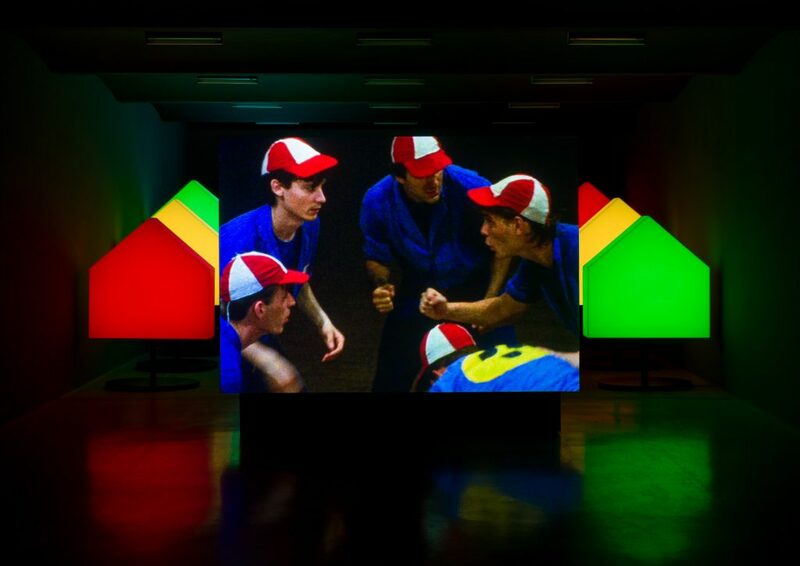 The film shows a team of uniformed players enacting the mechanics of a game of chance that generates points with the imperturbability of a machine. The protagonists, who cannot affect or predict its outcome, are not actors but act as players. They are spurred on by a song whose hysterical driving beat redoubles the implicit pressure to “perform,” in the economic and competitive sense of the word. 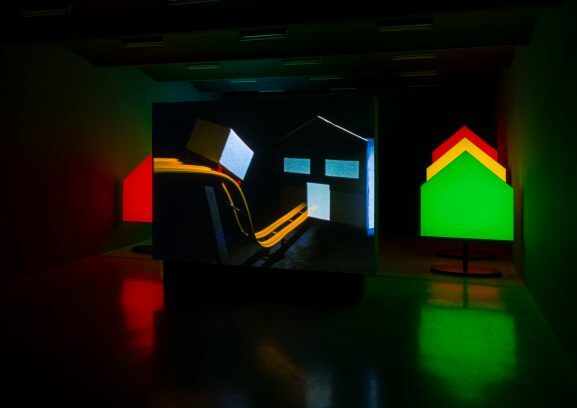 For the film installation in the last room of the Galerie, Beckman complements the projection with eight light boxes in the shape of a house, replicas of the original props that structure the gallery’s spatial depth and change colors in synch with the film’s rhythm. The motif of the house appears on several occasions in the film. At first it is a property unit in a subdivision, then it becomes part of the mechanics of the play and a target to hit and finally it functions as a scoreboard showing the accumulation of houses on one plot of land therefore not advancing the capitalistic motivation of the house. 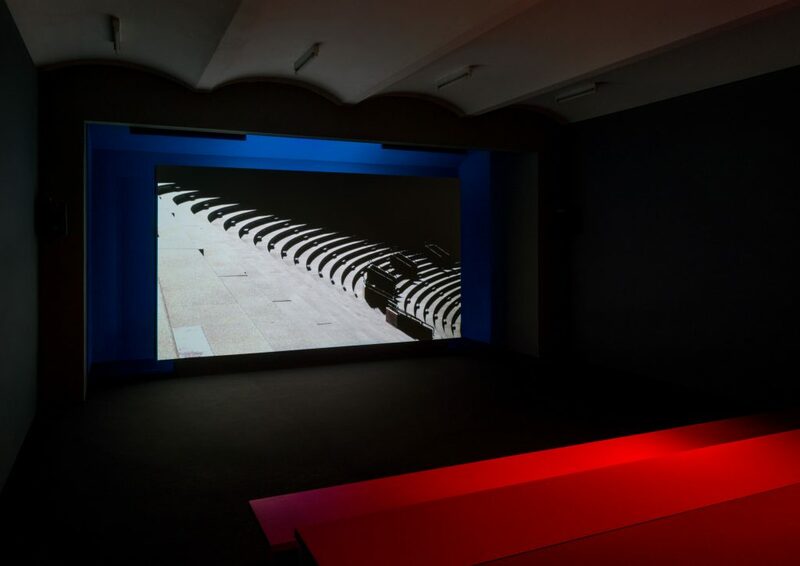 Beckman makes cinematography itself a medium of performance art in order to address fundamental questions such as the construction of movement and gestures, the regulation of space and time, and the joining of the imaginary and the real. 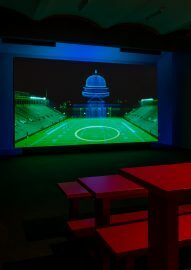 For the recently completed version of Tension Building, which makes its debut at the Secession, the artist has updated her filmic investigation against the backdrop of the last U.S. election to bring critical pressure to bear on the prominent role of athletics and spectacle in American culture. 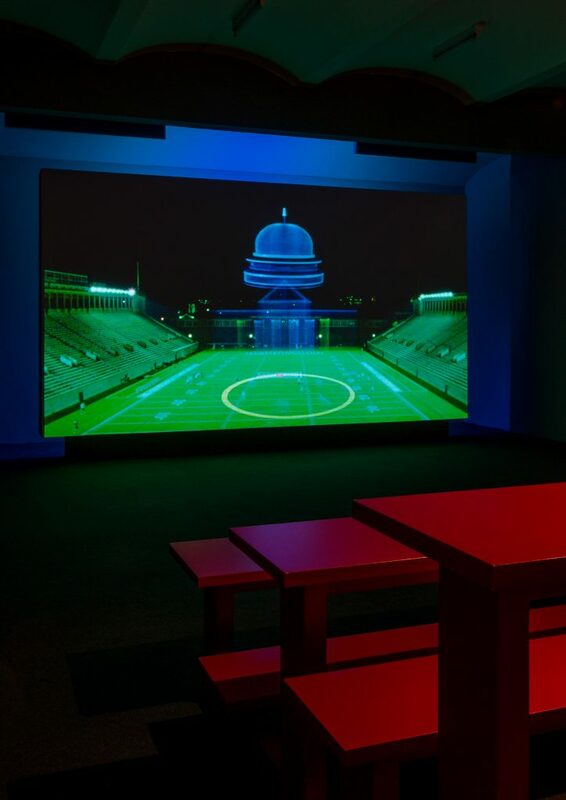 She created a film ending that depicts the U.S. Capitol as the final moment to the game. Beckman found this image on the Internet of the inauguration of the Harvard Stadium in 1910, which featured a model of the Capitol on the playing field. The final image tethers the stadium to its underlying structure that engages all national, militaristic and corporate interests into play. An extraordinary aspect of Beckman’s creative process is that she develops her motifs as well as the complex temporal and spatial structures of her films in drawings and paintings before shooting. 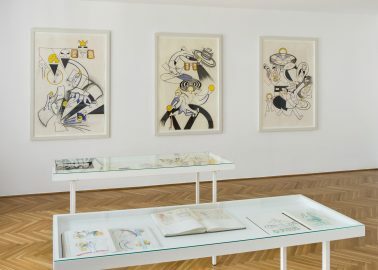 A selection of her drawings and notebooks, which have never been on public display, is on view in the Galerie as well as in the Grafisches Kabinett. Now widely recognized as an important representative of the so-called pictures generation, Beckman studied in John Baldessari’s Post-Studio class at the renowned California Institute of the Arts (CalArts) in the 1970s. 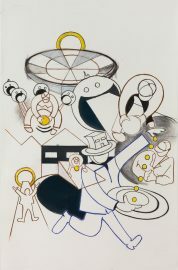 New York’s No Wave scene with its crossover media strongly influenced her, as did the work of Jean Piaget, the cognitive development psychologist. She has collaborated with numerous artists of her generation including Mike Kelley, Matt Mullican, Tony Oursler, and James Welling and was a pioneer of the artistic reflection on new and emerging technical advancements such as virtual reality, artificial intelligence, and computer games. 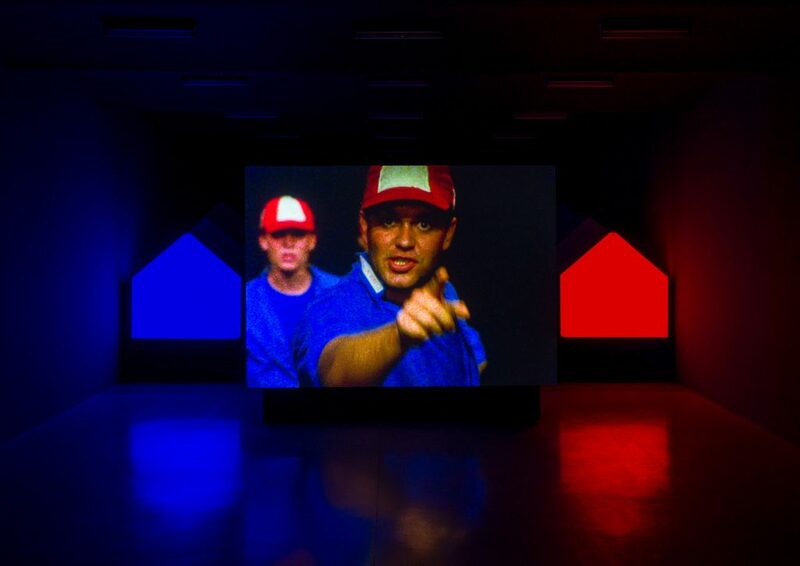 Ericka Beckman, born in 1951 in Hempstead (New York, USA), lives and works in New York City. 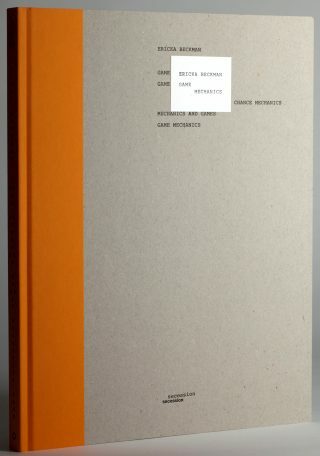 In conjunction with the exhibition, Ericka Beckman has designed an artist’s book that contains comprehensive documentation of her drawings and paintings related to the films from 1980 to 1999.